he played nick nack on my thumb. this old man came rolling home." 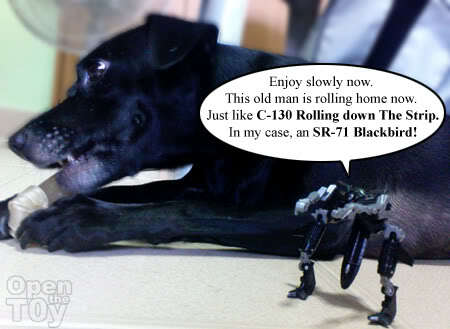 Well I get "this old man", my legend class Jetfire on a diplomatic mission to give my dog, Oreo a bone as a token of peace. It was proved once again that my dog is not interested with my toys unless of course they are soft toy that comes with squeaking sound. Well done Jetfire. Mission a success. Peace out! You know what his father transformed into? NOTHING! But he did it with pride! Dignity, dammit! LOL Snark, you are such of fan of the ROTF movie. Ha! Ha! That's cute! What will the old man do next? 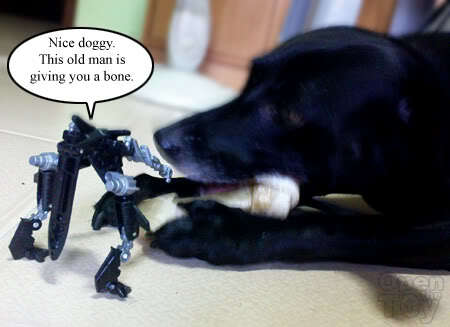 Luckily your dog didn't treat old Jetfire like a bone. lol funny! Cool comical clip. Lucky your dog wasnt interested haha!